With its square, jointed, succulent stems, this fascinating pelargonium could easily mislead the casual observer into mistaking it for a member of the Euphorbia family. Pelargonium tetragonum is a plant adapted to grow in dry habitats (xerophyte). It branches from the base and if supported by other vegetation, will reach a height of 2 m. The plant tends to sprawl, but can be successfully grown as a pot specimen. Pelargonium tetragonum is distinguished by its almost leafless, three- to four-angled, jointed and succulent stems. When present, the leaves are fleshy, palm-shaped and sometimes have red zonal markings. The very attractive cream to pink flowers occur in pairs on the flower stem. Each flower has four petals, with the upper two significantly larger than the lower pair. The large upper petals are streaked with red. The flowering time is from September to December. 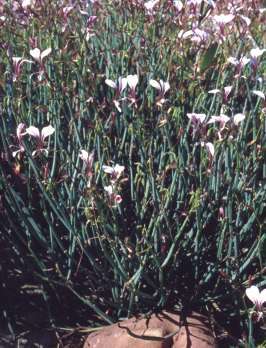 Pelargonium tetragonum is only found in dry habitats within a strip parallel to, but inland from the South African south coast, extending from Worcester to Grahamstown. This distribution thus extends from the winter rainfall region in the west to the summer rainfall area in the east. 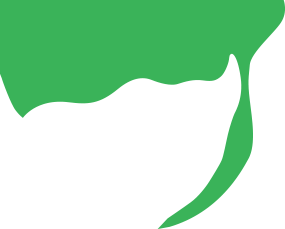 The specific name, tetragonum, is derived from the Greek words tetra (four) and gonia- (angled) and refers to the characteristic square-shaped stem. 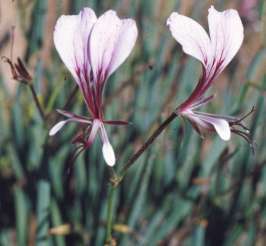 The genus Pelargonium consists of over 200 species, of which some 80% occur in southern Africa. Of these, approximately 80% are found in the southwestern Cape. The misnomer 'geranium' refers to the hybrids derived from south African pelargoniums, and now extensively grown throughout the world. Unlike many other pelargoniums, this species does not produce aromatic oils. However, the attractive flower and unusual growth form make this a worthwhile addition to any pelargonium collection.